Binary Hijack is an automated trading system that promises to earn traders $2,550 an hour. 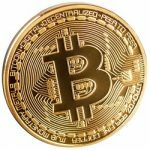 This binary trading system claims to be user-friendly and so easy that even the most inexperienced trader can easily earn millions of dollars with this trading system. We have done a thorough investigation of the Binary Hijack system to determine if these claims are true or false. The first thing that raises our suspicions about this trading system is the fact that it claims you can earn over 2 grand is just one hour. While binary options can be extremely profitable, it is highly unlikely that you will earn such a generous profit in that short of a time frame without investing thousands of dollars up front. 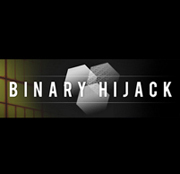 This leads us to believe that Binary Hijack is not a reliable trading system. Another thing that puts us off about Binary Hijack is that the presenter of the sales video “Nick” says he must first perform a “background check” on us before we can even sign up for the system. “Nick” doesn’t even give us his last name, yet he wants traders to give him their personal information. This left a really bad taste in our mouths. First of all, we doubt that “Nick” is even a real person, but rather a computer generated voice-over. There are just too many things about Binary Hijack that made us leery of this system altogether. In order to access the Binary Hijack system you must provide your personal information and supposedly “Nick” performs a background check before you are granted access to the system. 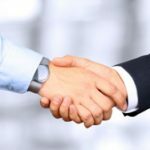 However, we feel this is not only dishonest and suspicious on their behalf, but is just a scare tactic, to convince us that this system is the “real deal.” Once you have supposedly passed the background check, you must create an account with one of their binary options brokers and deposit $250 before you can even begin trading. Binary Hijack then “hijacks” a bank trading account and copies their signal information and places trades on your behalf. We find this process suspicious as well. It sounds like a gray area, possibly even illegal. “Nick” doesn’t fully go into how the system works, so again this makes us a little Leary of the reliability of the system in the first place. Is Binary Hijack as scam? While we cannot say with absolute certainty that Binary Hijack is in fact a full-blown scam, we have every reason to believe that this system is in no way trustworthy. 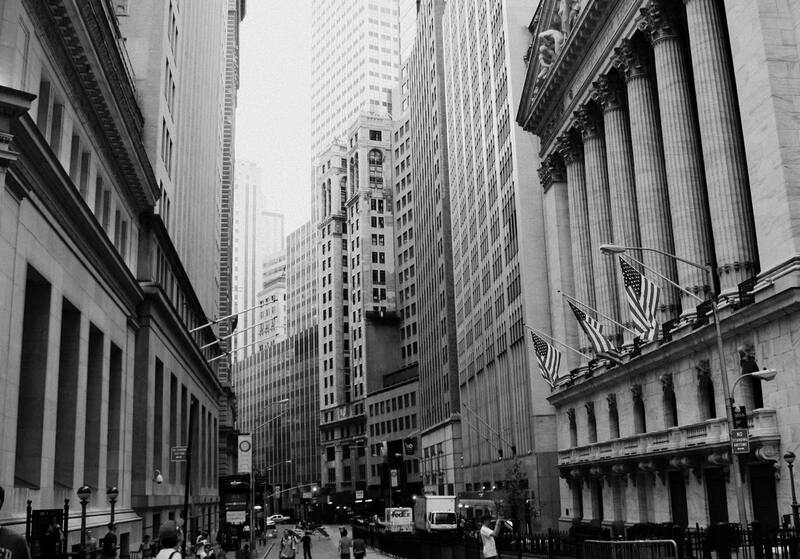 We strongly advise that you chose to trade with a more reliable system, one that has been proven to provide accurate and honest results. We have seen no proof that anyone has actually earned the profits that Binary Hijacker initially promise in their promotional video. We find this video to be misleading and therefore cannot endorse this trading system. After a detailed and thorough investigation of Binary Hacker, we cannot recommend this system for those who are serious about binary options trading. We advise that you opt for a more trusted trading system, as there are plenty of decent and honest systems available online. We find the lack of unbiased reviews very disturbing and the promises on the sales video to be extremely off-putting and misleading. 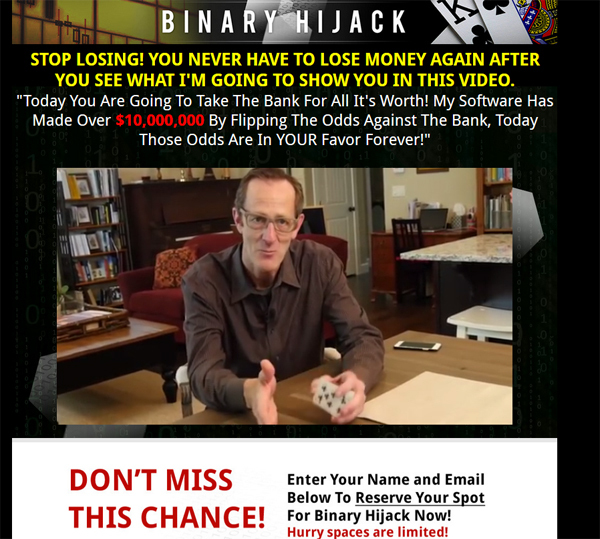 7 Binary Options review: Binary Hijack: 1 stars.